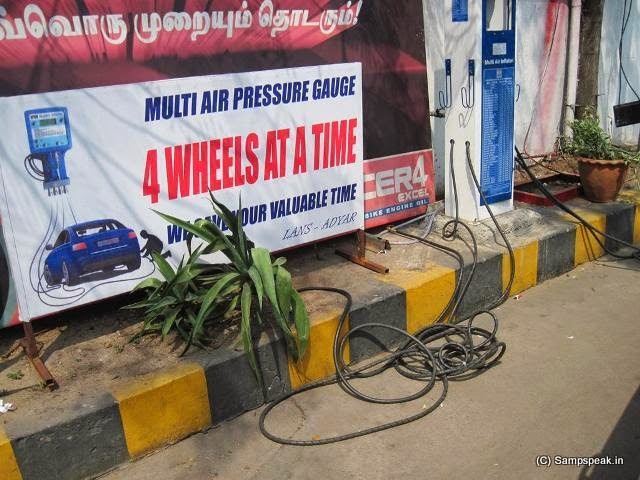 "Sampath Speaking" - the thoughts of an Insurer from Thiruvallikkeni: importance of inflating tyres........ and all 4 at a time !!! importance of inflating tyres........ and all 4 at a time !!! I had posted about ‘flat tyre’ earlier … - it is a deflated pneumatic tyre, which can cause the rim of the wheel to ride on the tire tread or the ground potentially resulting in loss of control of the vehicle or irreparable damage - simply called puncture…. We ride various vehicles – scooters, motorcycles, cars and more – not to forget the once ubiquitous cycle. All of them have wheels – fitted with tyres……made of synthetic rubber, natural rubber, fabric and wire, along with carbon black and other chemical compounds. They consist of a tread and a body. The tread provides traction while the body provides containment for a quantity of compressed air. In the latest vehicles, we have tubeless tyres – that do not have a separate inner tube. They have continuous ribs moulded integrally into the bead of the tire so that they are forced by the pressure of the air inside the tire to seal with the flanges of the metal rim of the wheel. ~ and often we stop at Petrol bunks not only to refuel the vehicle but also to check the air-pressure. Theoretically inflating a tyre can be done using a manual floor pump that we used for bi-cycles. Remember the vehicles literally ride on air. The pressure of the air inside your tyres is what supports the entire weight of your car! Pneumatic tyres are inflated with either compressed air or nitrogen gas. The amount or volume of the gas (either air or nitrogen) can affect its performance dramatically. 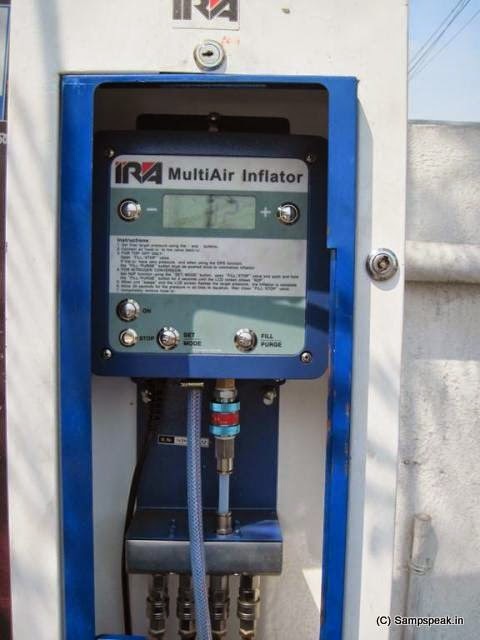 An air compressor is a device that converts power (usually from an electric motor, a diesel engine or a gasoline engine) into kinetic energy by compressing and pressurizing air, which, on command, can be released in quick bursts ~ and air compressors are used for inflating the tyres of vehicles too…. it is estimated billions of litres of fuel are wasted due to improper tyre pressure. Improper inflation leads to carbon monoxide pollutants, wear and tear to tyres and vehicles and can cause accidents too. At least the safety factor should drive people in to checking tyre pressures regularly. All vehicle manufacturers have guidelines for the ideal inflation of vehicle’s tyres. This is usually expressed in terms of pressure. 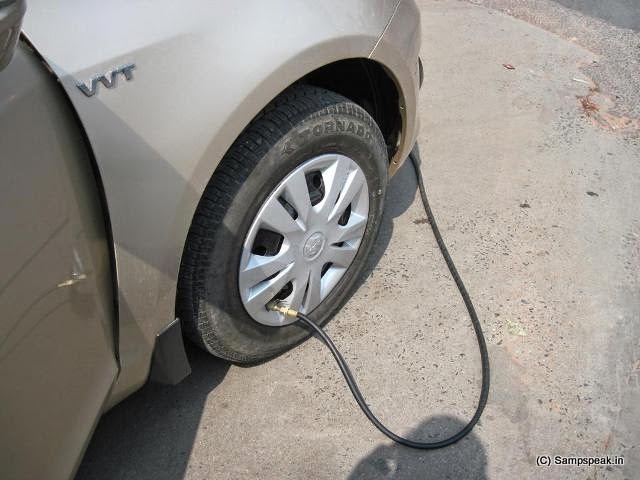 The vehicle manufacturer has designated the ideal tyre inflation based upon any conditions which the car is likely to face (number of passengers and load weight, for example), and maintaining this ideal pressure with regular checks will ensure you have the best ride and you will achieve the greatest longevity from your tyres. Pressure is measured by calculating the amount of air that has been pumped into the inner lining of your tyre in pounds force(PSI) or BAR pressure. Maintaining proper pressure can provide good economy – optimum usage of fuel. Over or under inflated tyres suffer more damage than those with the correct pressure and need to be replaced more regularly. Vehicles with under-inflated tyres have increased rolling resistance that require more fuel to maintain the same speed. Instructions manuals would state to check the tyre pressure when your tyres are cold. Practically, we tend to check the tyre pressure when fill fuel ……..sometimes, people are in a tear-away hurry and hence rush once the fuel is filled. 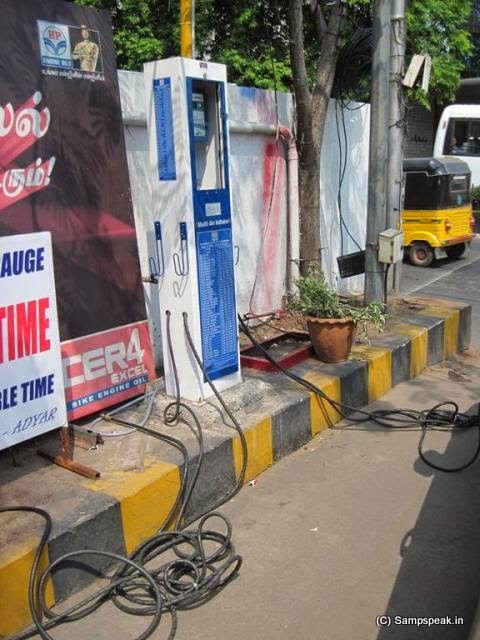 Other lesser mortals go to the end of the Petrol bunk, stop in the queue to inflate the tyres or check the pressure levels ….the assistance would bend to each wheel, remove its cap, fix the hose connected to the compressor and fill air….. – have you noticed any change in this ? Air is free – you should pay some change for the assistant who fills up air. We are facing trouble when we need to pump car tire. And it is costly also. After bought this air compressor I am very happy and do not facing any problem in road or anywhere and best air compressor reviews.